Heybridge Basin is popular with both local residents and visitors alike, and is an excellent place to enjoy a leisurely day with family and friends. It owes its existence to the Chelmer & Blackwater Navigation, which was completed in 1797. The original village centred around this canal, and the cottages next to the lock were built for the canal workers. 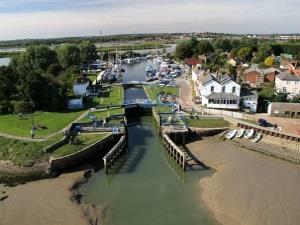 Every year, the annual Heybridge Basin Regatta is held, with yacht races and other activites for the family to enjoy.